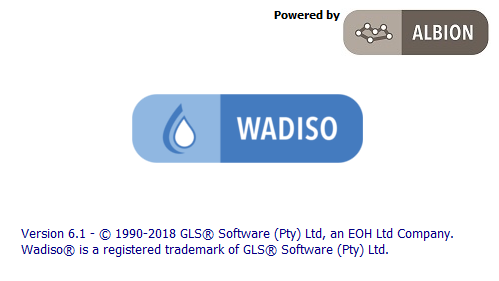 Wadiso is a comprehensive application for the analysis and optimal design of water distribution systems. 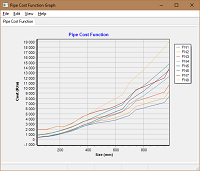 The program performs steady state and time simulation analysis including water quality analysis, and allows the optimizing of pipe sizes for planning purposes. 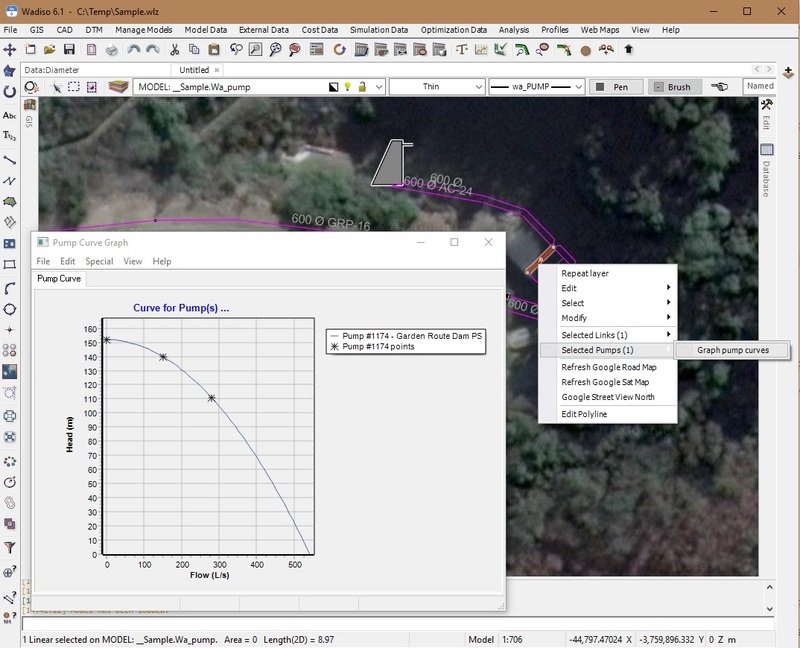 Wadiso offers some unique features, superior to other available water distribution system modelling software. Browse information on some of these features, download a fully functional evaluation version, or purchase a license right away. 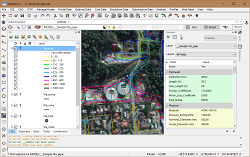 Wadiso is a comprehensive computer program for the analysis and optimal design of water distribution networks. The program originated from the WADISO public domain model developed by Prof. Johannes Gessler of Colorado State University for the Army Corps of Engineers. Dr Erik Loubser, studying under the mentorship of Prof. Gessler, assisted with the development of a unique system design optimization module of the program. 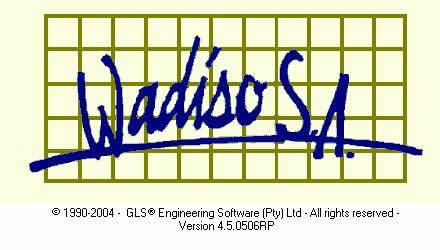 Subsequently a programming team employed by GLS Software (Pty) Ltd., the South African based software development company responsible for development and support of Wadiso in South Africa, substantially improved the basic Wadiso with regard to user friendliness and speed as well as interfacing with other application software such as water quality analysis, CAD, GIS and management programs. The improved Wadiso was subsequently referred to as WADISO SA. 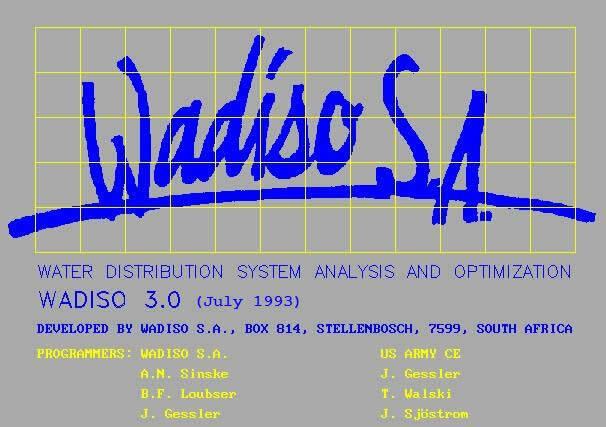 During more recent years Wadiso was then taken to a new level by the development of a full 32 bit Windows version. 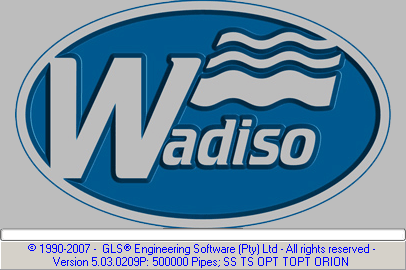 The latest edition is named Wadiso as the name is now a registered trade mark in South Africa. In the latest edition, the hydraulic model lives in the custom-developed Albion GIS platform. The following is an overview of the key features of Wadiso. 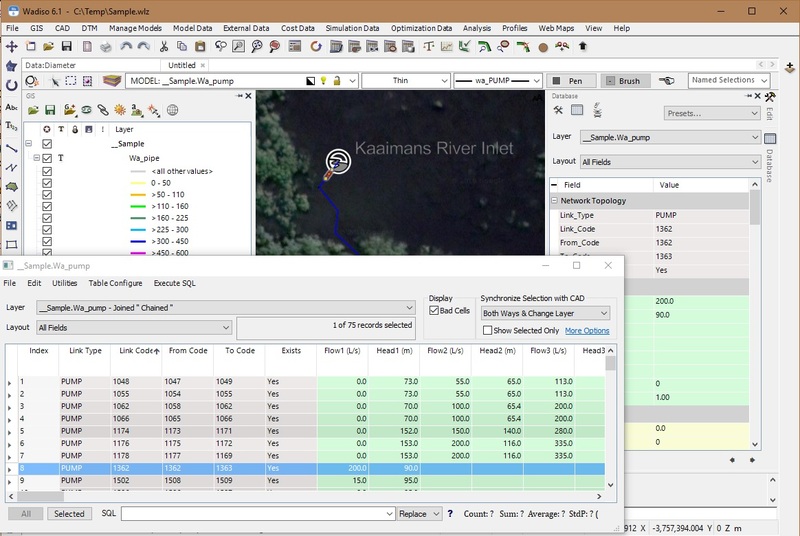 The program integrates steady state simulation, time simulation, water quality analysis and optimization with GIS-centric graphical displays of data and results into a single, most valuable tool for water engineers. Steady State Analysis Module: This is the basic module which allows for the input and editing of system data and parameters, and which calculates the flow and pressure distribution in the system under specific "snapshot" steady state conditions. Full GIS-centric graphical display of flows, pressures, etc. is available. 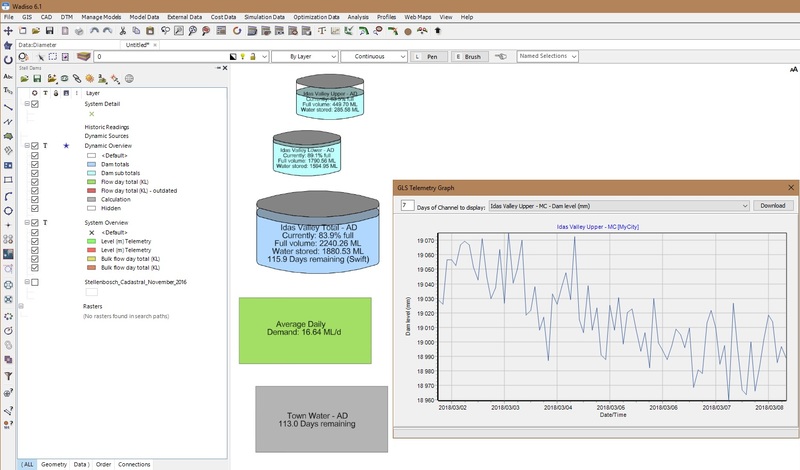 Extended Period Simulation Module: This module allows for modelling of diurnal fluctuations in water demand, and controls of pumps, valves, etc. in order to monitor system performance (e.g. tank level fluctuations, pumping cycles, pressure variations) over an extended period of time. Optimization Module: This unique module allows for the determination of future improvement needs, with the objective being to minimize capital expenditure while adhering to specified operational criteria. Water Quality Modelling. The embedded EPANet program module provides an array of water quality modelling features accessible from Wadiso. Gessler (1984) produces a new benchmark optimum solution with WADISO for the New York Aqueduct Tunnels problem. Gessler and WADISO (1985) wins the "Battle of the Network Models" at an ASCE conference in Buffalo NY, producing the most cost-effective solution to the "Anytown, USA" benchmark problem. Loubser, B.F. (1987), after extending WADISO to include storage costs in the optimization technique, improves the "Anytown, USA" benchmark previously set in Buffalo. Sinske, A.N. (1993) rewrites the WADISO tank optimization algorithm to take account of sparse matrix techniques. Raad DN, Sinske AN, Van Vuuren JH. (2008) designs evolutionary optimization algorithms for water distribution system design optimization. If you have modelled an interesting place using Wadiso we would love to hear from you! Please contact us. In all the above cases, the existing system and existing demands were modelled and analyzed, prior to an extension of the model to represent future scenarios. The optimization module of Wadiso was typically subsequently used to establish an economically optimal master plan for existing and future improvement needs of each system. City of Tshwane: 850 km pipes, 98 tanks, 45 pumping stations, Average Daily Demand of 510 Ml/d. City of Cape Town: 630 km pipes, 63 tanks, 19 pumping stations, Average Daily Demand of 860 ML/d. Seamless transition between integrated modules, e.g. CAD to GIS to Steady State Model to Extended Period Simulation (EPS) Model to Water Quality Analysis Model to Optimization Model. Synchronized GIS display, table input and property editing of any network element. 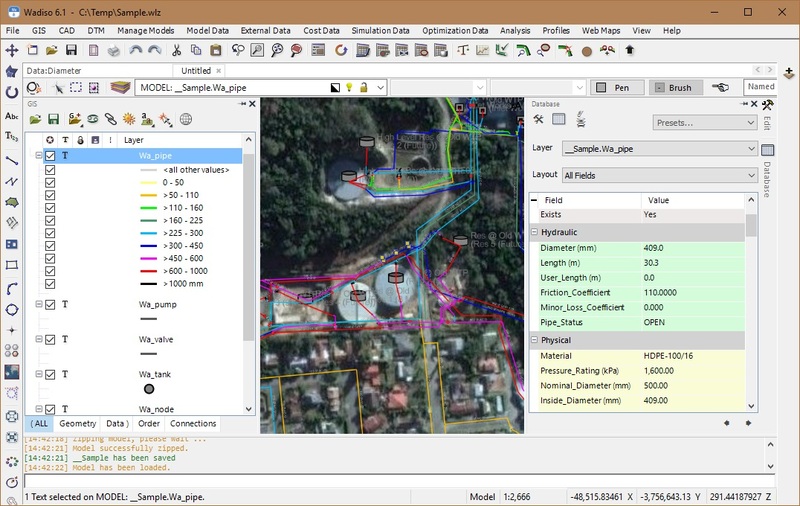 Non network data in either CAD, GIS or Imagery format may also be displayed as background, e.g. basemap/stand and street views layouts. All pipe data required for modelling is included in the database, including extra fields for user attributes. Graphical display of results, through colour coding, arrows on pipes, different line thickness, different node sizes, graphs, etc is available. The model can include pipes, tanks, pumps, and many types of control valves. Pumps can be modelled using a parabola fit through three known points on the manufacturer-supplied or calibrated pumping curve or using a series of Heas vs Flow points. 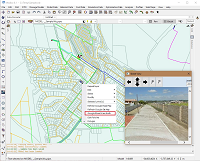 Version 6 simplifies the process of model building from a wide range of sources including as built drawings, CAD plans, GIS data sources, scanned images, schematic layouts, tabular spreadsheets or even hand drawings. 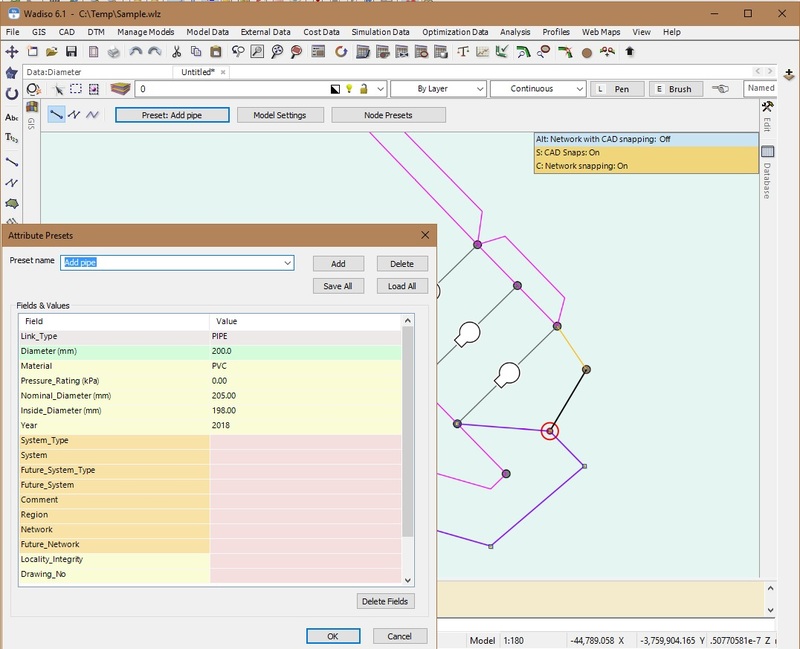 The process of adding model elements such as pipes, cables or catchments with the minimum number of clicks has been at the forefront of the new design to minimize repetitive tasks for the modeller. Customizable presets simply data capturing. In Wadiso, head loss in pipes is calculated by either the Hazen-Williams equation or the Darcy-Weisbach equation. For the latter, the user specifies an absolute roughness k in which case the frictional coefficient is calculated with the appropriate equation. 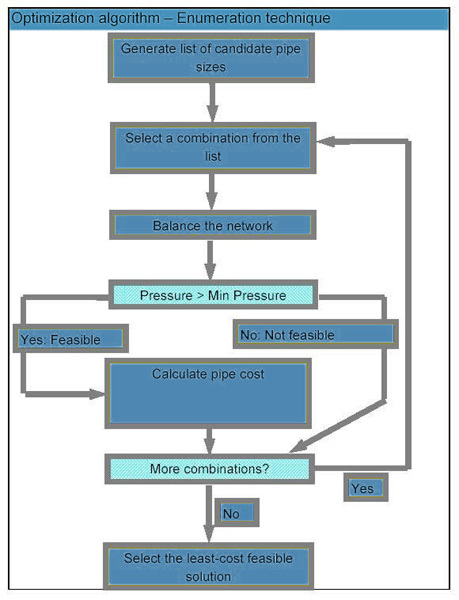 A number of numeric schemes have been proposed and used in the computation of the pressure and flow distribution in pipe networks. Each one has its specific characteristics: some schemes are simple to implement, others require the least amount of computer memory, or the least amount of computer time to find the answer. Again another characteristic is how the scheme performs under extreme conditions, does it easily "crash" or is it particularly "robust" when analyzing unusual situations, as might be encountered during extended time simulation or during optimization. Wadiso now uses the industry tested EPANET2 hydraulic engine which is a gradient algorithm that employs pipe equations in which the flow in pipes and head at connecting nodes are solved simultaneously. Linearization of both sets of equations (extended to all pipes and all nodes) result in a system of linear equations to be solved through iteration until convergence is achieved, expressed as a percentage of absolute flow change. Pipe sizes are selected from a discrete list of available sizes, and is not a continuous variable. Cost functions are rather arbitrary and cannot be put easily into a mathematical form. 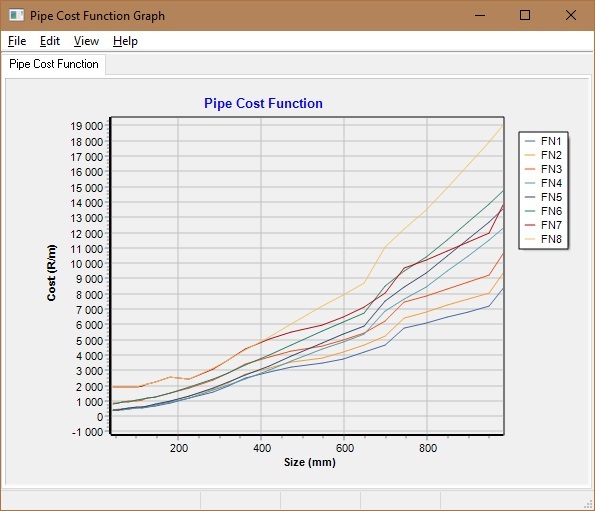 The cost function of a looped system as function of pipe sizes to be selected may have several local minima, yet of interest is only the global minimum. Optimization should be carried out for several demand loads so that pressure requirements which may differ from load to load can be met simultaneously. In Wadiso a relatively straightforward algorithm is employed based on "exhaustive enumeration". The user specifies the sizes to be considered for each pipe and the program simply tests all possible combinations of pipe sizes to check whether the specified pressure constraints are met. In the process of testing the technique takes advantage of two considerations: after a functional combination of pipe sizes has been found there is no need to test any other pipe size combination which is more expensive and after a non-functional solution has been encountered any other size combination, with all sizes equal or less than in the non-functional solution, is non-functional as well. (There are some exceptions to this rule which Wadiso takes into account.) As a result of considering those two aspects Wadiso does not need to calculate a flow and pressure distribution for all combinations. Indeed the larger the total number of combinations the smaller the percentage of combinations for which the pressure distribution needs to be calculated. It is not unusual for Wadiso to test less than one percent of all possible combinations for pressure. The program also takes advantage of the convergence characteristics of the numeric method mentioned in the previous paragraph. If pressure needs to be calculated the algorithm may quickly (in two or three iterations) determine that a combination will or will not work. Only in very few combinations will it be necessary to calculate pressure distribution to a high degree of accuracy. Exhaustive enumeration has one more important advantage: it allows for the establishment of a queue of "Pareto Optimal" solutions, that is solutions which may cost a little bit more than the optimum solution yet provide for better pressure, or solutions which may slightly violate the pressure requirement but do offer some savings. In other words the user gets immediate feedback on the sensitivity of the optimum to the specified pressure requirements. It is this queue of Pareto Optimal solutions which many users of Wadiso find to be of particular value. 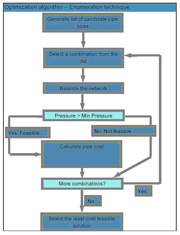 Extended period time simulation of pipe networks serves three important functions. First, instead of only providing a snapshot of system performance under some rather arbitrary condition, it will provide a time history. Of particular interest are pressure fluctuations in low pressure areas, and pressure response to fire flows and pipe breaks. Secondly extended time simulation is required for the reliable sizing of water storage tanks. To keep such simulation realistic it is necessary to model not only varying demand patterns in residential, industrial and commercial areas of the network, but also the rather complex schemes by which the pumps and valves in the system are operated and controlled. Control of pumps and valves by means of pressure sensors in critical areas of the network, by water level in storage tanks as well as time (to take advantage of low cost energy periods) can all be modelled. Thirdly, the extended period time simulation can be utilized to model water quality criteria such as the growth/decay of chemical constituent in the system, water age, and/or the tracing of water originating from a specific source. Interfacing between SCADA and the software provided can occur on a dynamic basis. In such an interface metered flows, pressures, tank levels, pump and valve status etc. are converted to relevant parameters and variables which are imported to update the data tables of the simulation and analysis models. The open input and output data structure of Wadiso allows for easy interfacing in this regard. Wadiso employs the industry standard SQLite file-based database format, but can also interact with CSV text files and DBF data files. Pilot applications have been developed to interface with various SCADA or telemetry systems that provide their data as web services. This can be customized to a clients requirements. Wadiso provides for an extremely flexible query system in order to map data and results. For both links and nodes additional data can be included in user-fields. This allows for the inclusion of information pertaining to age, material and pressure classifications etc. of pipes, present and future allocation of stand numbers etc. to nodes, over and above the normally required data defining the component. 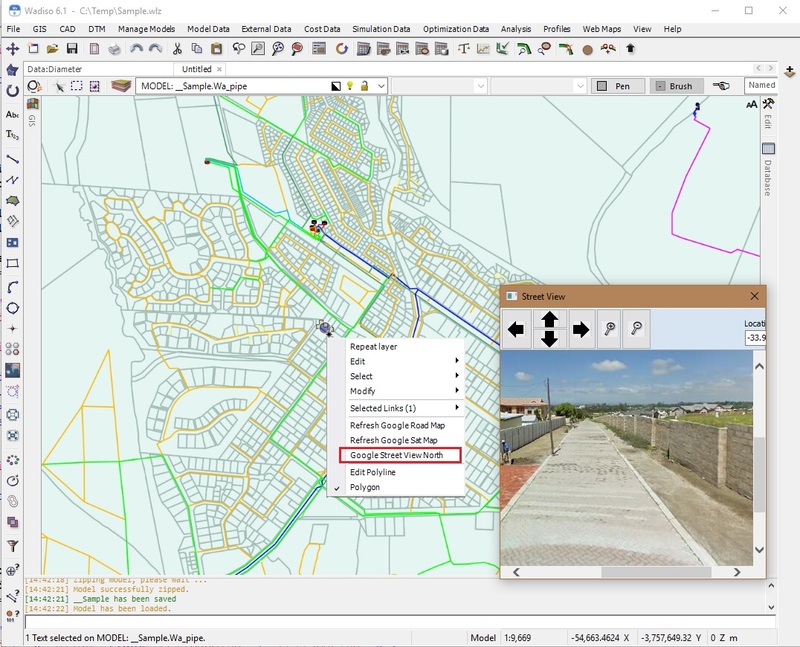 A link and node legend is always shown in the GIS layer manager, in which the colour coding parameters for any one of the link or node data fields can be specified, if a map is to be produced showing output data such as the flow velocities or energy gradients in the pipes, or residual pressure at nodes, with different colour coding and different line widths. Text from the different fields can also be annotated on the links and nodes. Specify fields can be selectively annotated, e.g. the link # and pressure, or diameter. A predefined list of themes simplify the result presentation. Graphs can be displayed for the results of any link or any node, for the entire extended time period. 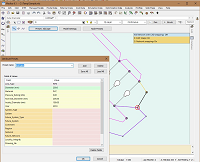 User selected routes for profiling can be specified graphically in the Wadiso graphics interface. 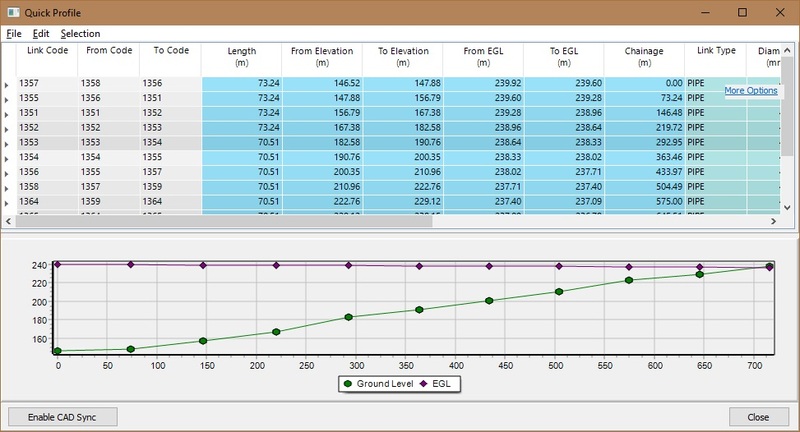 A profile, display an/or plot showing ground elevation and energy grade line for the route is available from the Steady State Simulation module of Wadiso, as well as for any time period within the Extended Period Simulation module. Two displays are available: A Quick Profile tool allows for interactive changes to elevations and the more advanced GIS profiler, renders profiles in the CAD/GIS environment in a new drawing.